Personnel: Van Morrison (vocals, acoustic guitar); Johnny Scott, Mick Green (guitar); Paul Godden (steel guitar); Bob Loveday (violin); Cavin Wright, Fiachra Trench (strings); Geraint Watkins (piano); Ian Jennings (double bass); Paul Riley (electric bass); Bobby Irwin (drums). Over the course of his remarkable career, Van Morrison has ranged so widely across the musical map that it's not exactly a surprise to hear him settling down for a straightforward American roots effort. 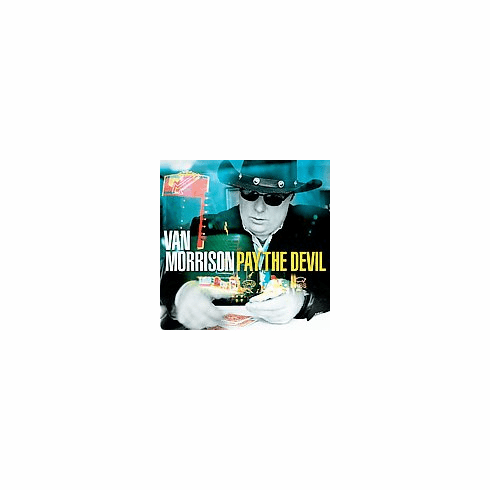 PAY THE DEVIL, released in 2006 on the Lost Highway label, finds Morrison abandoning any remaining mystical Celtic trappings to tip his hat to the country music of the 1940s and '50s. The arrangements are appropriately spare, with fiddle, steel and acoustic guitar, bass, and drums propping up most of the songs, while strings and backing vocals flesh things out on occasion. There are three Morrison originals and a handful of songs popularized by Hank Williams ("Your Cheatin' Heart" and "Half As Much," among them) and Webb Pierce ("There Stands the Glass" and "Back Street Affair"), but the selections are all of a piece, sounding as though they're being transmitted from a Nashville barroom of yore. Morrison's voice doesn't have the elasticity it once did, but there's a textured world-weariness, perfectly suited for these songs, that lets listeners know he's still the man. Rolling Stone (p.90) - 3 stars out of 5 -- "[W]hen he sings 'My Bucket's Got a Hole in It,' he finds the same fertile territory that Hank Williams Sr. did, balancing between a quotidian complaint and Sisyphean dread." Mojo (p.p.90) - 4 stars out of 5 -- "[I]t's a country album and it's good. Good Van Morrison and good country. Maybe the best country by an old master from outside the genre since Leonard Cohen tackled the Tennessee Waltz." Uncut (p.96) - 5 stars out of 5 -- "PAY THE DEVIL is a kind of prodigal's return, combining three fine originals with superlative interpretations of songs made famous by Hank Williams, George Jones, Webb Pierce and Conway Twitty." Dirty Linen (p.93) - "Van Morrison tackles country and Western music with 15 tracks and a heart full of Celtic soul."